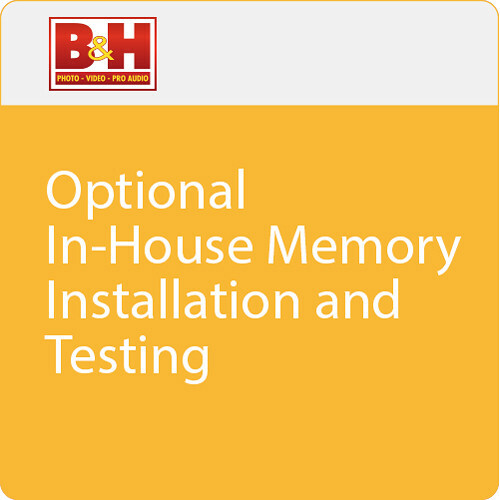 Select In-house Additional Computer Memory Installation and Testing when you want B&H to do the installation of additional memory - when purchased on the same order of the computer. The Additional Memory Installation and Testing is done by a certified technician in our Computer Service Center, so that it is assured that the original manufacturer's warranty on the computer continues on throughout the warranty period. This item doesn't include software installation. If you also need software installation use B&H item code # BHWEBPCC. Note: The only warranty on the additional memory is the warranty provided by the manufacturer of the additional memory. The install is done by a certified technician who knows the do's and don'ts of installation, so that the manufacturer's original warranty on the computer continues on and doesn't get voided by unwanted moves. Testing is done on the computer to check if the system recognizes and allocates the additional memory. The Installation and Testing will allow you to start working on your new computer as soon as you get it. In-house Memory Installation & Testing Service is rated 4.8 out of 5 by 39. Rated 5 out of 5 by Skip Souza from Worth the price! I am pretty handy at building/modifying my computers but replacing the ram on the Asus netbook is another thing altogether. It was definetly worth it to me to have B&H so the work so that I knew it would be ready to roll upon arrival. Rated 5 out of 5 by Anonymous from Good service as you are always They installed my RAM and everything is working also i receive my old ram and i can give him to somebody or keep in as backup ram, and B&H test my new ram and laptop and this is a good reason to buy this service because you well be sure your new laptop and ram work without problem, really great job and i don't have any issue. Rated 5 out of 5 by Misstxaz from Excellent Service I have to admit I am not a techie. I was so thrilled to read that B&H offered In-House memory installation and testing- I immediately placed an order for my new Imac 5K, along with a memory upgrade to 32g of RAM. The product arrived with the memory installed and working great! I would trust B&H with any product upgrade. Rated 5 out of 5 by Ralph from Keeping promises. I needed a new computer, and I needed it fast. The problem was that the one I could afford did not have enough RAM. Enter B & H customer service. Not only did they get the computer to me in four days, but they did so with a boost in its operating speed. Thank you B & H! Rated 5 out of 5 by Tracy from Amazing! Lightning fast installation of 32Gig Ram on imac by the professionals @ B&H. The people doing their tech are the best in the business. It was a thrifty choice to buy a system with less RAM and more everything else, then have B&H add more. Never a hitch. Rated 1 out of 5 by Kristen from Horrible customer service I would never, ever purchase anything from B & H again. They refused to take back a faulty computer that I had received in the mail the day before. They didn't even do me the courtesy of calling me to discuss it but just did it via email.